The outcome of Sunday’s Ukrainian parliamentary election is likely to be a majority of deputies in favour of war in the east, and against Russia. This is because the Ukrainian economy is ruined, so for the foreseeable future, war draws US (IMF, World Bank) and European Union cash stipends which are a better-paying option than peace. Vladimir Paniotto, head of the Kyiv International Institute of Sociology (KIIS), released this morning his projection of seats in the new Verkhovna Rada, based on the final polling of voter preferences which KIIS has conducted. Allowing seats for only those blocs and parties which attract more than 5% of votes nationwide; redistributing the votes of the marginal sub-5% candidacies; and filling only 425 seats in the new chamber because Crimea, Donetsk and Lugansk are not represented, President Petro Poroshenko’s bloc will occupy 92 seats. To carry a majority of parliamentary votes for new legislation, budget spending, and government appointments, and after Poroshenko counts his share of the single-constituency races, Poroshenko will fall short. 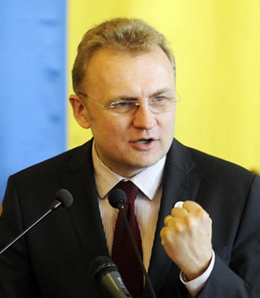 According to Paniotto, the war party in the new parliament will comprise 30 seats behind Oleg Lyashko; 41 for outgoing prime minister Arseny Yatseniuk, whose last-minute surge in the popular vote is not reflected in any of the pre-election polls; 27 for the mayor of western region capital Lviv, Andrei Sadovyi (right); and 21 for Yulia Tymoshenko’s Fatherland bloc. Altogether, 119 – comfortably ahead of Poroshenko’s bloc, and with the single-constituency deputies, a majority. The banned Communist Party, plus partisans of Oleg Tigipko and Antoly Gritsenko, plus an alliance of eastern region oppositionists are all struggling to get over the 5% threshold. So too is the fanatically pro-American Svoboda group from the west. According to the KIIS projection, about 15 seats in the new parliament will be taken by deputies favouring peace in the east. 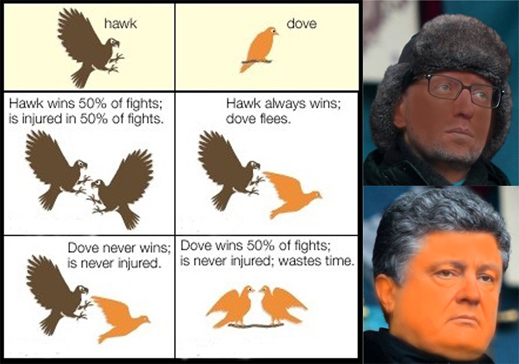 Even if they side with Poroshenko, the doves still trail the hawks.